Gila River Arena, formerly known as Jobing.com Arena and, before that, Glendale Arena, is the home of the Arizona Coyotes NHL hockey club (formerly known as the Phoenix Coyotes). From time to time there are concerts here. The Arena was known as Jobing.com Arena until September 2014. Before that, it was the Glendale Arena, from the time it opened in 2003 until October 2006. It is located immediately adjacent to Westgate Entertainment District and University of Phoenix Stadium where the Arizona Cardinals play NFL football. Tanger Outlets is nearby. Gila River Arena is not accessible by light rail. From the South: Take Loop 101 north to Glendale Avenue. Make a right (east) on Glendale. Gila River Arena will be at 95th Avenue, on the right. Turn tight into parking lot. From the North: Take Loop 101 south to Glendale Avenue. Make a left (east) on Glendale Avenue. Gila River Arena will be at 95th Avenue. Turn tight into parking lot. From the East: Take Glendale Avenue west towards 91st Avenue. Turn left on 95th Avenue, into the parking lot. From the West: Take Glendale Avenue east to 95th Avenue. Turn right on 95th Avenue, into the parking lot. ​See driving times and distances from various Greater Phoenix cities and towns to Glendale. Gila River Arena is a multi-purpose sports and entertainment facility located within the 223-acre Westgate Entertainment District. In addition to being home to the Arizona Coyotes, the Gila River Arena hosts concerts and family shows, as well as signature sporting events like figure skating, basketball tournaments and All-Star games. The Gila River Arena was named Jobing.com Arena until September 2014, and it was called the Glendale Arena from the opening in 2003 until October 2006. 3. From scalpers/ticket exchanges -- but beware of fake tickets! Gila River Arena is the home of the Arizona Coyotes NHL hockey club (formerly known as the Phoenix Coyotes). Concerts and other special events also take place there. Use this stadium seating chart to determine where your seats will be at Gila River Arena for hockey games. Note: To see the image above larger, simply temporarily increase the font size on your screen. If you are using a PC, the keystroke to us is the Ctrl + (the Ctrl key and the plus sign). On a MAC, it's Command+. Which are the best seats for hockey? Many people like to be right at center ice, where they can be certain to see the action at both ends of the ice. Some people like to be right on the ice where they can pound on the glass and "express themselves" to the hockey players. Personally, those are not my favorite spots to watch the Coyotes; I like the corners, sections 105, 107, 116 or 118. That way I don't have to keep whipping my head back and forth, à la tennis match, to watch the action. I also prefer to be about 10 rows up from the ice for a better view of the other end. Gila River Arena also hosts several major concerts and events throughout the year. For those shows, there will be more seats, located in the center where the ice would normally be for hockey. Some shows will have an end stage, and some will have a center stage. Gila River Arena is located at Westgate Entertainment District in Glendale, Arizona, west of Phoenix. It is adjacent to University of Phoenix Stadium, where the Arizona Cardinals play NFL football. 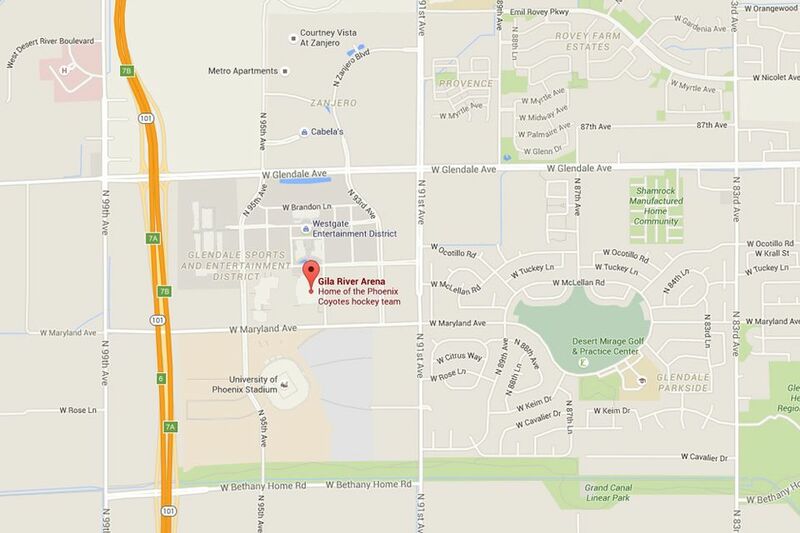 The arena is conveniently located off the Loop 101 Agua Fria Freeway. The arena is NOT accessible by Valley Metro Rail. Which Golf Club Company Has Its HQ in Phoenix? You Can Take a Tour! Looking for Great Deal in Glendale? Try Tanger Outlets.